Carolina Catholic chats with Bob Kinsman, the Cape Fear Deanery coordinator for the Diocese of Raleigh’s COR Seminar on St. John Paul II's Theology of the Body. The COR Seminar will be presented by author, Christopher West, at St. Michael the Archangel, in Cary on Saturday, July 26th from 8:30 am till 1:30 pm beginning with Mass celebrated by Bishop Burbidge. In this show, we learn about Christopher West, his book, the Theology of the Body Explained, and how Theology of the Body seeks to equip men and women to learn, live and share the beauty of the divine plan for human life, love, and sexuality in a new evangelization. 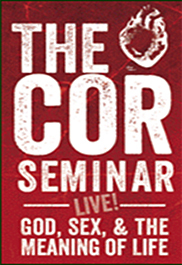 Join us on Saturday, July 26 for The COR Seminar Live presented by Christopher West! It is the fruit of two decades of his searching for the best way to introduce people to the life-changing vision of John Paul II’s Theology of the Body. “Cor” is Latin for heart. Through a creative blending of live music, film clips, and Christopher’s dynamic presentation, The Cor Seminar–Live! will take participants on an exhilarating journey into the “cor” of God’s plan for human life, love, marriage, and sexuality – and, through that, into the Mystery at the “cor” of, well, everything.... See more at: http://www.christopherwest.com/the-cor-seminar-live/#sthash.zk1iJBy4.dpuf. Or, watch this you-Tube video: https://www.youtube.com/watch?v=pbvn873-e28. The Cor Seminar is intended for anyone and everyone with a “hungry heart” – young, old, married, single, priests, religious, seminarians, Catholics and non-Catholics, believers and non-believers. All are welcome, including teens. However, as a benchmark, Christopher generally gears his presentation towards a young adult and older audience. The most common response to this seminar is: “I was raised in the Church and never heard this before, why not!! ?” The tragedy is that we can go to church our whole lives and never really know who we are, whey we’re hear, what our faith holds out to us. The Theology of the Body provides the interpretive key that makes everything the Church teaches “click,” and we come to see a vision of life and love so beautiful, so grand, it takes our breath away. What does my ticket price cover? The ticket price covers the cost of hosting and promoting the seminar as well as the materials you receive as part of the seminar. It also helps support the global mission of The COR Project in sharing John Paul II's Theology of the Body around the world. Is there something I can do to prepare for the seminar? Prayerfully read Fill These Hearts, Christopher West's most recent book. Watch the seminar/book trailer here: http://youtu.be/pbvn873-e28. When inviting others to the COR Seminar we encourage you to show people this trailer on your iphone or smart phone. If you would like to register, click here. Please note that tickets are $29 or $20 if 10 or more are purchased!